SEQui2R has gone Analog!!! “SEQui2R Synth” is the little BIG brother that retains 99% of its predecessor’s features and has some new surprises too! This is more than a step sequencer, a gater, an arpeggiator or a pulse engine… you choose the notes that suit your composition and SEQui2R Synth will do the rest! 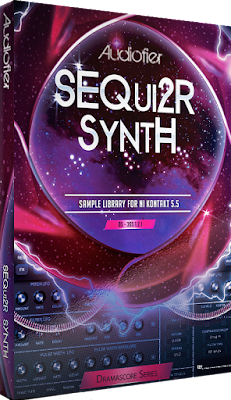 What Exactly is “SEQui2R Synth”? SEQui2R Synth is a step sequencer, gater, arpeggiator and pulse engine all morphed into one unique Kontakt instrument. Its a live notes input step sequencer and riff creator that adjusts to song’s key/scale. You choose the notes that suit your composition and SEQui2R Synth will do the rest. Use it for cinematic music, EDM, underscore, ambient and anything else you can think of that needs some beautiful, lush, dark, gritty or thundering pulsing sounds! SEQui2R Synth shares the same Step Sequencer engine of its sibling “SEQui2R EX”, but it hosts a completely re-designed sound engine which, instead of sampled sounds, produces Analog Style Waveforms. Random/Improvisation per step plus Volume, Pan, 2 Filters and Distortion per step! “SEQui2R Synth” can be as simple as complex as you want it to be. Simply load up a patch and start playing, or dive into more detail to really get to the heart of the best. It features two separate sound engines, 8 distinct phrases recorders, with independent step panner, step volume, 2 step filters, step distortion and a step lo-fi per engine. With SEQui2R Synth’s Custom Key Manager you can play in your desired key using the correct intervals: Major, Minor, Diminished and Whole-Tone scales are provided. You can even make up your own, save them, export them and import them! N.B. Requires FULL RETAIL VERSION of NI KONTAKT 5.5. It is NOT compatible with the Free NI Kontakt Player. So What Exactly Can I Do With “Sequi2r Synth”? 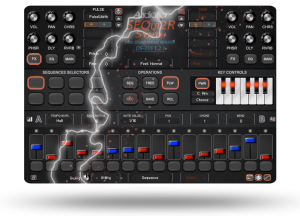 “Sequi2r Synth” is the perfect tool for breathing life into a track, from subtle background pulsing rhythms and ambient soundscapes to classic 80’s synthpop and thumping EDM! Additionally, thanks to it’s incredibly flexible step sequencer and massive selection of effects and filters including Chorus, Phaser, Delay, Reverbs, Flanger, Rotor, Bus Compressor and Cabinet Simulation you are in total control of your sound! The sonic manipulation possibilities of “Sequi2r Synth” are endless, the only limit is your imagination! Normally €64.49 – get it at 70% before its gone! Absolute no-brainer at 70% off the normal price (normally €64.49)! Requires FULL RETAIL VERSION of NI KONTAKT 5.5. It is not compatible with the Free NI Kontakt Player.